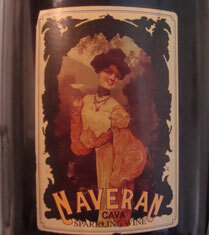 Naveran makes several Cavas as well as a few still wines, and since I hadn’t had a Cava in a while, I asked friends Kent and Kevin of Blanchards Liquors in Allston Mass for a couple of recommendations. They quickly steered me to a couple Naverans and you’ll find tasting notes at the bottom. Naveran Cavas, founded in 1984, is located in Penedés in the Alt Penedés subregion. Penedés is where most Cava is produced. They have 100 Hectares of vines under cultivation, averaging 827 feet above sea level, and the topsoil is limestone with subsoil of sand and clay. Temperatures between April and October average about 66 degrees Fahrenheit with hot days and moderate nights. Annual rainfalls are about 24 inches. They use ecologically friendly methods, including no pesticides or herbicides, and 100% organic fertilizers. They grow both traditional white grapes, namely Macabeu, Parellada and Xarel•lo, as well as Chardonnay and Viognier. Red grapes are Cabernet Sauvignon, Pinot Noir, Syrah, Tempranillo and Merlot. Cava Naveran Brut – Made with the three traditional grape varieties, it is 50% Macabeo, 30% Xarel.lo and 20% Parellada, and a vintage dated wine. Aged on it’s lees for 18 months. Tasting note below. Cava Dama – 85% Chardonnay and 15% Perellada. Aged on its lees for 24 months. Tasting note below. Cava Perles Rose – A Pinot Noir Rose. Cava Perles Blanques – Pinot Noir and Chardonnay. 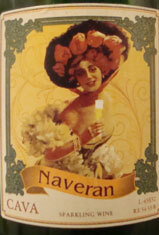 Cava Naveran Odisea – Chardonnay and Parellada. Cava Naveran Nature Millesime - Macabeo, Xarel.lo, Parellada and Chardonnay. They also make quite a lot of non sparkling wines: Clos Del Pi – a Cabernet Sauvignon, Merlot, and Syrah blend, Don Pablo Riserva – 100% Cabernet Sauvignon, Clos Antonia – a white which is 100% Viognier and fermented in oak barrels, and Manuela De Naveran – 100% oak fermented Chardonnay. This is their traditional Cava made with traditional grape varieties: 50% Xarel.lo, 30% Macabeo, and 20% Parellada. US$16 but I bought it on sale for $10 and it is an absolute steal at that price! The nose is tropical with a touch of pineapple, apple, high toned spiciness and minerals. On the palate we have apple, red apple peel, and Asian pear. It's warm and sweet tasting (for a fairly dry wine). A Meursault like spiciness. A step up from the Cava Dama below above to my taste. I do prefer Cava from the traditional grapes however and everyone else may not. The nose is apples and pear with more minerals as it breathes. It is clear and clean tasting with some apple and pear like the nose and a slightly spicy quince characteristic. Mostly Chardonnay with 15% Parellada. I paid slightly under US$20 for the bottle, and it comes in an extra wide bottle. The palate had fresh and crisp green apple, lots of minerality, and a touch of orange fruit. A pleasant wine.